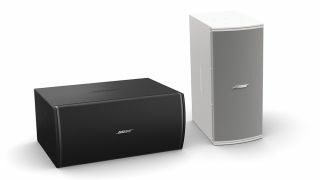 The What: Bose Professional is now shipping the MB210 compact subwoofer, designed for background/foreground music and small sound-reinforcement systems that require low-frequency extension down to 37Hz. The What Else: The MB210 compact subwoofer showcases 500W long-term power handling, a low frequency response down to 37Hz and 123dB maximum continuous SPL. Weighing in at 41 pounds, it is available in black or white and ships with a u-bracket for easy mounting. The Bottom Line: The MB210 subwoofer features two 10-inch high-excursion woofers, derived from the Bose Professional F1 subwoofer, in a compact Baltic-birch plywood enclosure optimized for fixed-installations.